Poetry. Translated into the Italian by Maria Enrico. Facing page English. 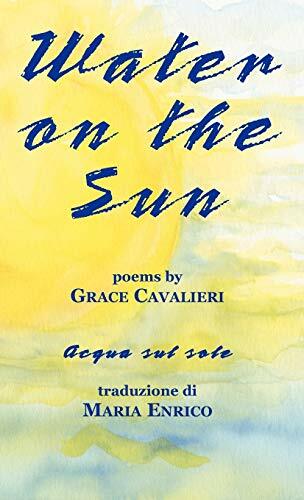 Grace Cavalieri's new book of poetry is winner of the Bordighera Poetry Prize sponsored by the Sonia Raiziss-Giop Charitable Foundation. WATER ON THE SUN shows an interesting meeting point of American montage culture and Italian cadence-in-lyric. "Cavalieri has an imaginative, wise, and contemplative voice, with a sense of surprise that awakens our thinking. One wants to dwell over her poems which cover a large range of themes from a surreal and dreamlike existence to family love and world crisis. This is original poetry with a quirky and richly fanciful element, yet always accessible to the heart and mind, even as it sometimes leaves us wondering at the turns taken" -Daniela Gioseffi. Grace Cavalieri is an author of books and plays, as well as two opera productions. She has produced and hosted The Poet and the Poem, which is in its thirtieth year and is broadcasted from the Library of Congress via NPR satellite. Cavalieri is the book review editor for The Montserrat Review.com, and reviews theater in her column, America s Stage. Her weekly column of poetry commentaries, Innuendoes, is heard on MiPOradio.com. In addition, Grace conducts poetry workshops throughout the country. Maria Enrico was born in the US, grew up in Europe, and returned to the US for collegiate schooling. She is Assistant Professor in the Department of Modern Languages at Borough of Manhattan Community College/CUNY. She speaks English, Italian, French, and Spanish. Recent translations include plays of Dario D Ambrosi, Garbage from Pinocchio Nero, by Marco Baliani, and The Jar by Luigi Pirandello.